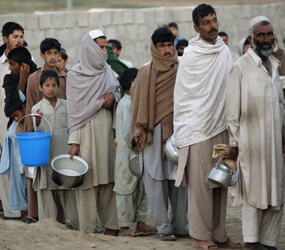 BANGALORE, India – Catholic Relief Services’ country representative in Pakistan said the agency will focus on helping families who are housing hundreds of thousands of Pakistanis displaced by an army crackdown in the northwestern part of the country. “These families are going out of their way to help the displaced people,” Darren Hercyk, the CRS official, told Catholic News Service May 21 in a telephone interview from his office in Islamabad, Pakistan. “Seeing the suffering of the refugees is incredible,” said Hercyk, who visited troubled areas of the North-West Frontier province the previous day. Provincial officials say more than 1.7 million people have been displaced from the mountainous region bordering Afghanistan since early May, when the Pakistani government stormed the stronghold of the Taliban, an Islamic militia. More than 80 percent of the 1.7 million people fleeing the army crackdown are being sheltered by host families. In the province’s Swabi district – nearly 100 miles from Islamabad – Hercyk met a farmer who had emptied his tobacco-drying rooms to house dozens of displaced Pakistanis. “In one part of his farm, there are four families staying in two rooms. This consists of 20 children (plus) 16 females and six men. The men sleep outside of the rooms at night. The rooms have no toilet facilities,” Hercyk added. He said the farmer told him he would be happy if CRS could build toilets and erect tents in his compound because he would need the spare rooms soon, when the tobacco harvest begins. “Lots of arrangements have been made by the government and others, and supplies are being sent to the camps regularly,” Hercyk said. “But the host families are shouldering the burden on their own. “Our priority is to help and enable the host families in the task they have taken upon themselves,” he said. CRS, the U.S. bishops’ international relief and development agency, had already distributed emergency kits for hygiene and cooking as well as bedding and temporary shelter materials. By May 21 the agency had helped 500 families – averaging seven people per family – and hoped to have doubled that number by May 24. Depending on the international response, Hercyk said, CRS hoped to help at least 10,000 families with emergency supplies. Hercyk also said that many of the families from places like Swat, where the Taliban is strong, expressed fear that they would even have a house to go back to when the army operation ends. He also said that while local Pakistanis are “extremely friendly and cooperative,” CRS relies on its local staff and partner agencies to distribute the supplies because of the sensitivity to foreigners in the troubled region.